Vice President Joseph Biden is in Asia on a trip that will take him to Japan, South Korea and China for high-level meetings that come at a time when tensions have ratcheted up in the region over China’s decision to declare an air defense zone over disputed islands – just one of the issues underlying the unease among the three countries. China’s military power is regarded with alarm in Japan and South Korea. Nearly all Japanese (96%) see China’s power as bad for their country as do 91% of South Koreans, according to a Pew Research Center survey this spring. Underlying that sentiment are the territorial disputes over islands in the East China Sea. More than eight-in-ten (82%) Japanese see these disputes as a big problem, as do 77% of South Koreans. The point of contention between Japan and China involves eight islands known as the Senkaku islands in Japan and the Diaoyu islands in China – islands that are uninhabited but are near key shipping lanes and potential oil and gas finds. China’s newly-declared air defense zone also has revived concern in South Korea, which has its own dispute with Beijing over a submerged rock known as Ieodo in Korea and Suyan Rock in China. That area is also said to be surrounded by gas and mineral deposits. Ill feelings among the people of the three nations are not confined to the territorial disputes. 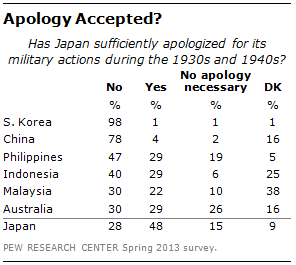 Almost seven decades after the end of World War II, a big majority of South Koreans (98%) and Chinese (78%) believe that Japan has not sufficiently apologized for its actions in their countries during the 1930s and 1940s, according to our spring survey. Those feelings were exacerbated in April when a group of conservative Japanese lawmakers visited the Yasukuni Shrine in Tokyo to honor Japanese soldiers killed in the war. As for the U.S. role in the region, while the administration’s strategy for dealing with China has come into sharp focus among allies in the region, the U.S. still has a strong reservoir of good will on which to draw in Japan and South Korea compared to China. Nearly seven-in-ten (69%) Japanese regard the U.S. favorably compared with only 5% who have a positive view of China, according to the spring survey. In South Korea, 78% have a favorable view of the U.S. compared with 46% who regard China positively. 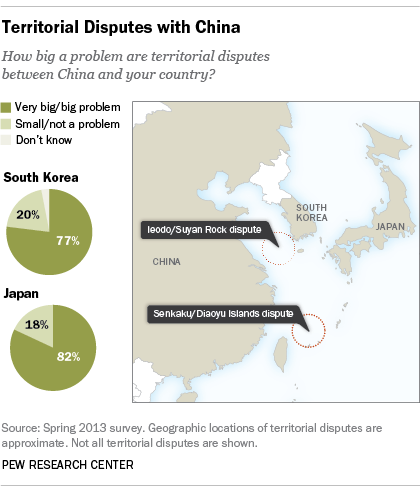 The Japanese see China as an enemy rather than partner by a 40% to 11% margin, with 47% seeing it as neither. South Koreans have a less negative view, with 27% seeing China as a partner, 17% as an enemy, and 53% seeing it as neither. (The South Koreans are also more apt to say China will eventually or already has replaced the U.S. as the world’s leading superpower, with 56% of them holding that view compared to 24% of Japanese). One area where the U.S. gets low marks along with China, though not quite as low, is in perceptions of how much it takes the interests of South Korea and Japan into consideration in making foreign policy decisions. About six-in-ten South Koreans (62%) and Japanese (59%) say not too much or not at all. However, bigger majorities in Japan (89%) and South Korea (79%) have that view of China.